Do you remember when you bought your first mobile phone? Perhaps you were able to stump up the £3000 needed for a cell phone back in 1985, or perhaps you got mobile when digital came along in the early 90s, or when the first pay-as-you-go service began in 1997? Everyone has their own story. Despite being as common as a Bic Biro, the mobile phone has remained a highly visible 'badge' product, reflecting its owner's outlook and values. Whether you are a top executive or a teenager, certain phones have been the coolest on the planet for a short space of time. In recent years, values of early mobile phones have nearly outstripped their cost back in the day. The mobile phone is now also a serious investment as well as an important piece of social history. There have been some big changes in the values of vintage mobile phones. Check out our updated Price guide. Read our review of the Hagenuk GlobalHandy. It was a sleek functional phone from Germany and the first phone without an external aerial. Have you ever wondered how Nokia managed to dominate the mobile phone market in the 90s and early 2000s? Their divide and conquer approach offered a phone for every taste. What price a mobile phone? 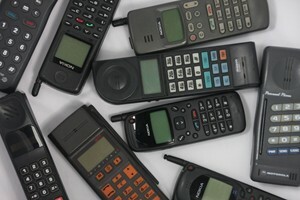 How much did mobiles cost in the 80s and 90s? Read our new article about the most expensive phones. See How much did mobile phones cost?